It is less than a week a day till we get our hands on Dustin's Antiquité Poupée Kaleidoscope eye kit for Le Metiér de Beauté, so here's a short inspiration feature to whet your appetites and a last reminder to get your orders in. No guarantees any stock will be left after its debut! 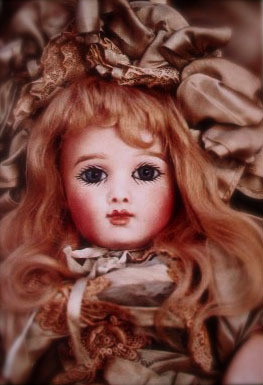 Dustin's inspiration for Antiquité Poupée is its namesake, an antique doll you might find while rummaging through vintage stores or your grandmother's attic in search of the elusive beauty of yore. Sometimes I wonder how it would be like to be of a time where mass production is a rarity, where everything would be hand-crafted and delicate and exquisite. A shameful confession: When Dustin first sent me this, I was reminded of those American Girl dolls that we both absolutely loathe. Needless to say the doll above, adorned in luxurious silks, cannot be compared to those plastic monstrosities (I hereby apologize if you actually like said American Girl dolls. They just remind me too much of Chucky). 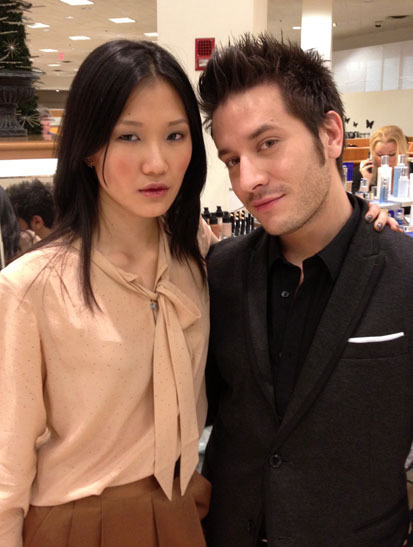 Here's a shot of Dustin touching up the model's eyeliner. For those who haven't had the fortune to get a makeover from him, um, this is how it looks. Once again, Le Métier de Beauté Antiquité Poupée will retail for $95 and will be exclusively available at Bergdorf Goodman. I just got wind that the kaleidoscope is enjoying an early release and will arrive just in time for Black Friday! The number you need to call is 212-872-8612 to get your own. Thank goodness I'm in New York for Thanksgiving because I'll be getting mine hot off the shipping box. I came across this post: http://messywands.blogspot.com/2011/11/rouge-darmani-400.html and I was wondering what eyeshadow/blush are you wearing? It's a great look! Thanks. I will probably do a separate post on the eye look from the Rouge d'Armani feature since I used a number of colors there. The blush is Burberry Earthy. As for the blush in my Ara Red feature, unfortunately I do not remember the exact one I used. My best guess based on the accompanying pictures in my folder is Illamasqua Ambition. Hope that helps! Thanks! That really helps. Looking forward to your eye look post. That promotional picture is horrible. Truly awful. I guess they're not aiming for the European market with the over plucked eyebrows and the 70's polyester-clad housewife-look. Can't you be the campaign girl?